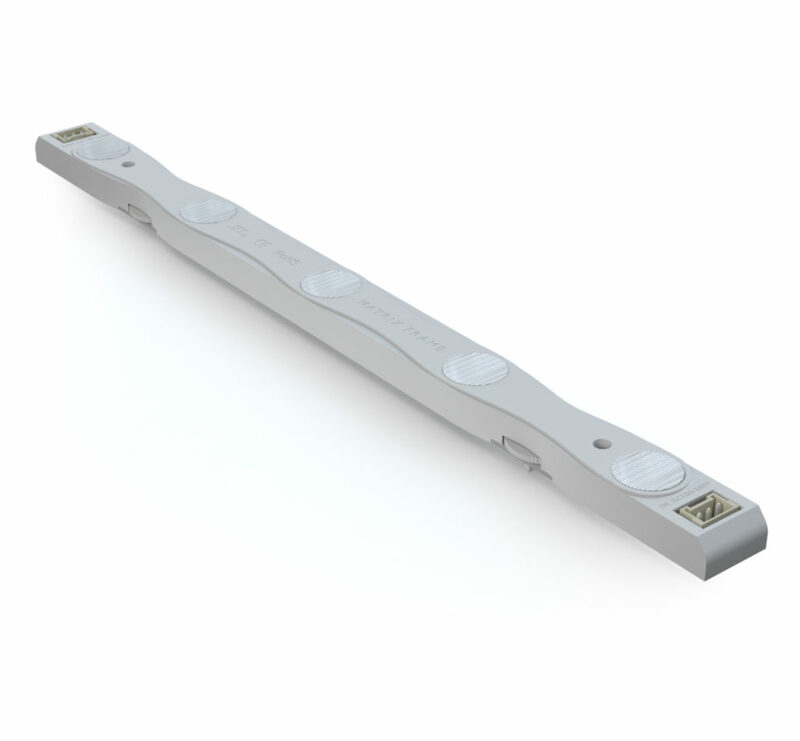 We are extremely proud to present the Matrix BIPS LED Module. With its Built-In Power Supply, the BIPS LED Module makes perimeter lighting for your Matrix Frame Light Boxes easier than ever before. The BIPS light bar eliminates the need for a separate power supply and all of the wiring and splitters between the two. With the enhanced design of the BIPS Quick Connect ports, connecting multiple light bars together on larger light boxes is a much simpler task. You can connect up to 40 BIPS LED Modules together on one power cord. Simply connect the BIPS LED Module to a 110v or 240v power source and the built-in power supply automatically inverts the signal to the 24v needed for the LED light on the light bar. Like all Matrix Frame lighting products, the new BIPS light bars are energy-efficient LED modules that only require 15 Watts per LED module. They have a life expectancy of over 50,000 hours for a lighting solution that is easy on the environment and your budget. Also, replacement of the light bars is simple and convenient. With our built-in twist lock connectors, you can easily switch them out on the spot. Of course there are many new accessories that comes with the Matrix BIPS LED modules, like different lengths of Extension Cords, US/EU/CN Power Cords for Wall Sockets, End Plug, EMC Cable Stop and a Cable Grommet set to protect the cable from the aluminum frame. BIPS will boost your profit, a huge advantage in this competitive market. Standard Color Temperature (CCT): 6500K. Operating Voltage: 110v to 240v inverted to 24v. Sales Price of a Matrix Light Box is 25-30% cheaper. The BIPS LED Modules are ready to ship today. Instruction Videos are just an email away. Please let us know if would like any additional information.